This week the University of Arizona Poetry Center hosted a book launch and reading for me and the marvelous poet Susan Briante. We had over 200 people in the audience. Tucson is a great town for writers and books. I’m grateful to live in such a community. As I share stories from this book, I am coming to learn how much people love to hear the one about the two elephants I met at the Little Rock Zoo. At the reading last week up at the Grand Manan Library, a woman in the audience who had clearly been moved by the story bought a copy of the book for a friend who had worked at an elephant refuge in Maine. Yes, Maine. A place in Hope where elephants could retire in peace. Something had gone terribly wrong there and an elephant had trampled his keeper to death. A bad day for an elephant can be perilous for a human being. She was giving the book to this other woman who had been there in hopes she might find some consolation in its pages. That is my hope. And in Tucson I heard story about an elephant grieving for a man he’d been close too, lingering over the place where he’d died and repeatedly touching the ground, maybe even stroking it. This morning I had some time to walk near my new house off Territory Drive in the Tucson foothills. 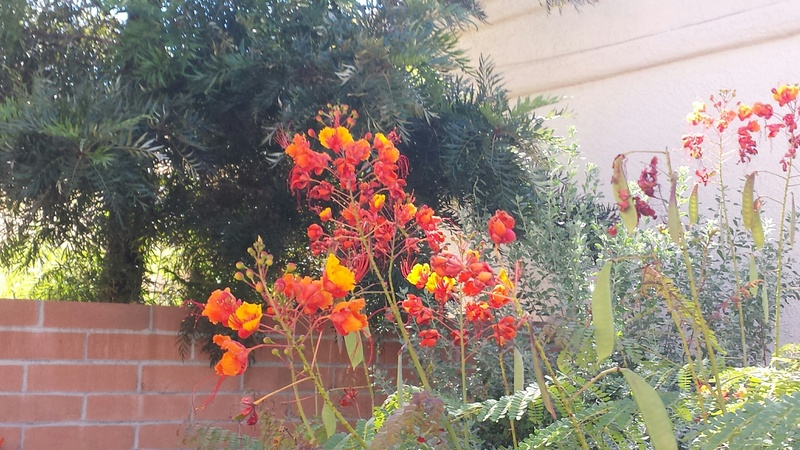 The desert is radiant green right now after a hearty monsoon season. 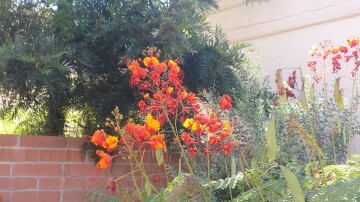 Sonoran Birds of Paradise exploding into late bloom. Fairy duster too. This neighborhood is right near the base of the Santa Catalinas, so that the mountain presence is always in conversation with human habitation. There’s a lot of said habitation up here, but in my neighborhood the houses and condos are laid out in such a way that the desert remains gorgeously in tact. Walking along hilly Territory Drive and appreciating the visual balance between land and houses, I remembered the master work by Rene Dubos, The Wooing of Earth. He wrote that the landscapes we love are most often not ones that speak of pristine wilderness but rather landscapes such as Tuscany or Vermont where the scene suggests a long and balanced relationship between land and people, patterns of use that speak of an equanimity between nature and culture–or perhaps a seamless presence in which there appears no boundary between the two. They become one at least in mind’s eye and that is a nourishing vision.